Notes: Certified organic, single vineyard. On the palate: Medium-bodied. Mixed berry jam, blueberries, chewy, some tannin. Finish: Jammy then dry, much more tannic than on the palate, lingers for a while then fades rather quickly. Parting words: Trader Joe’s Reserve wines are never bad, but they can occasionally be dull. I wouldn’t go so far as to call this one dull, but I’ve had more interesting Syrahs. For what it is, it delivers. There is lots of varietal character and it did well with corned beef. It would probably pair well with other rich red meats. For the price, it’s a good wine. 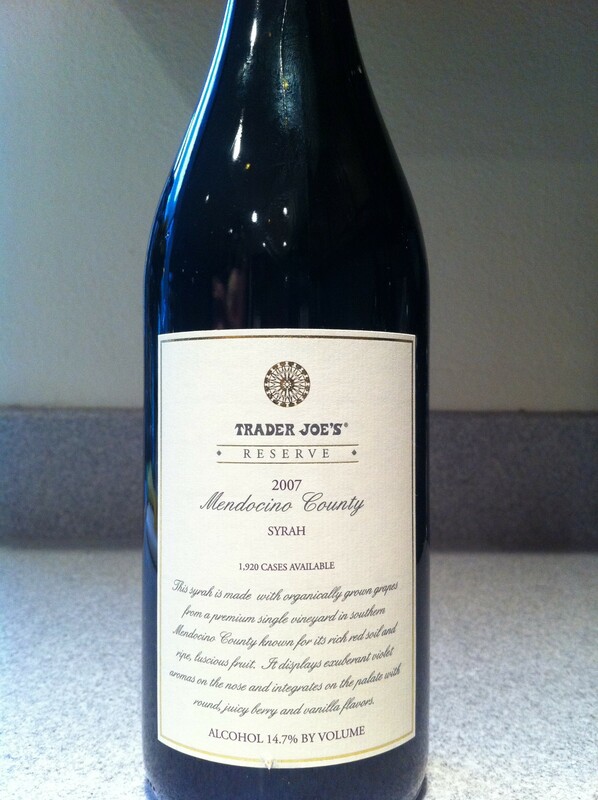 Trader Joe’s 2007 Reserve Mendocino Syrah is recommended.